Medievalists working in modern languages face a happy dilemma: we sometimes have the privilege of teaching works in our own subfield to a captive audience of language majors who need to take upper-division courses in the target language in order to complete their degrees. 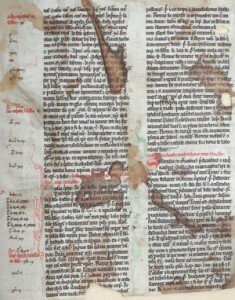 In some rare cases these students are actually required to take courses on premodern works. On paper this is a wonderful opportunity to share with our students the same works that got us all fired up about medieval literature in the first place. But there is a problem: medieval vernaculars are difficult, and students may come to the classroom with facile but entrenched preconceptions about the difficulty, irrelevance, and strangeness of medieval texts, even those in modernized versions or in English translations. One approach to this problem is to preempt these preconceptions by working to demonstrate the relevance of medieval texts, their value for understanding current-day issues and debates (I discussed this approach in survey courses in a previous post). We can address the question of difficulty by excerpting, modernizing, translating the texts in question. Break them down into digestible bites so the students will not feel overwhelmed or linguistically incompetent. This approach comes with a price: if we teach modernized versions, our students get little exposure to the linguistic reality of the culture we are teaching them. Their understanding of the target language is less diverse, less historically informed. Learning to read medieval registers of a vernacular language is a window onto linguistic diversity, one that persists in modern non-normative dialects. 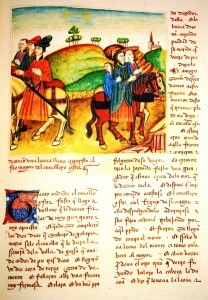 Medieval registers of modern languages also reveal commonalities with other modern national languages that have since been repressed. There are other reasons to teach original versions of medieval texts. There is a satisfaction that comes with overcoming the uncomfortable, the challenging, with rendering the strange familiar through sheer effort. Students of languages are not strangers to this process, but by the time they have achieved sufficient proficiency in the target language in question, having to face a steep linguistic curve as advanced upperclassmen may seem like an ambush: I wanted to study Spanish literature; I didn’t sign up for…this? 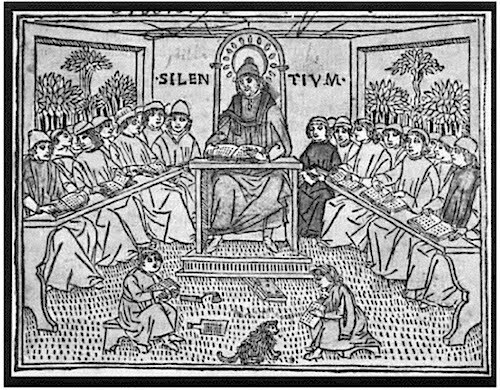 This fall I will be teaching an upper-level seminar in my field, and I have chosen to return to a pedagogical model we all know well: the philology seminar. Instead of teaching a series of short excerpts or modernizations of texts, I will teach the whole of the original Libro del cavallero Zifar in ten weeks, in chunks of some twenty pages per class session. We will begin with an introduction to medieval Castilian phonology, morphology, orthography, and lexicon. Students will write critical commentaries and modernizations of weekly selections. And yes, they will write a term-end literary critical essay. I believe the students will suffer some. They have not ever been asked to do this before. They have read very very little, if any, medieval Castilian. At best they have read very short excerpts of Gonzalo de Berceo or Juan Ruiz, usually with accompanying modernizations or English translations. There will be blood. Petrus de Capua. Distinctiones Theologicae. England, 13th. The first weeks will likely be rough going. But I hope they will gain something as well. I am hoping they will ramp up, and that the sixth or seventh reading assignments will go down far easier than the first and second. They will have the opportunity to tackle the whole book, and work through that sense of strangeness they often bring to medieval language. What about you? 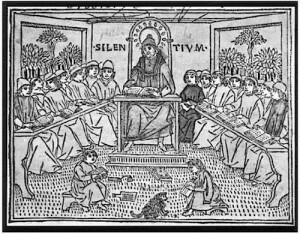 What has your experience been in teaching entire medieval works in original versions to undergraduate students of modern languages?